This is a first in recent American history -- maybe in all American history: public opinion appears to have stayed the heavy hand of the American war machine. The wheels were in motion both in the US government and in the lapdog corporate media for a strike on Syria this week. But our Nobel Peace Prize-winning Fuhrer has flinched and will now seek Congressional approval before unleashing the missiles and drones of war. Alternative media king Alex Jones is hailing this as a victory for the embattled peoples of earth against the Powers That Be, and perhaps he's right. I doubt these developments will keep Obama from his murderous mission for long, but it certainly is a beautiful moment. It reminds us that our overlords are fundamentally wrong in their central conceit: they are not all powerful, and they can be stopped (albeit probably briefly in this case). 1. Saturn sesquiquadrate the US Mars. Action, restrained. 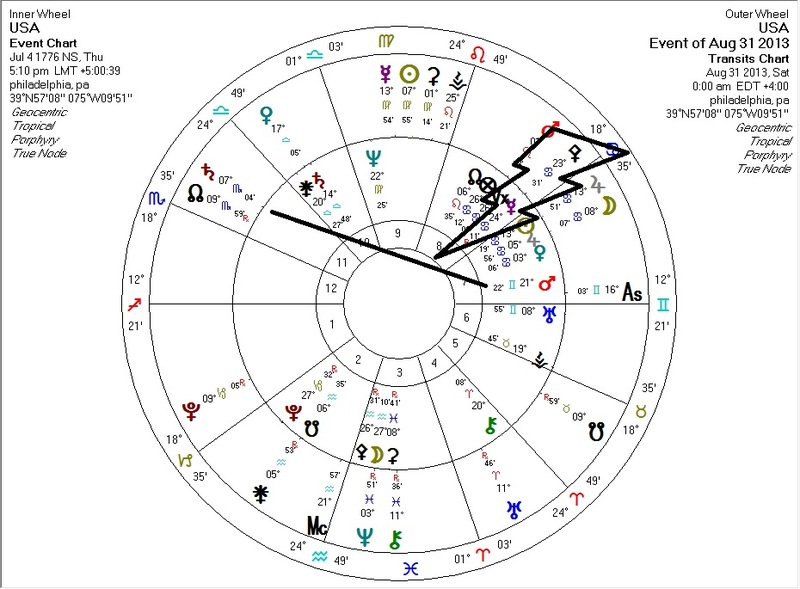 Obama is experiencing a similar transit, as his Mars squares the US Mars. Unfortunately, this aspect has already peaked and is waning. 2. Pallas conjunct the US Mercury. The planet of peace, in combination with Mercury, is probably the strongest libertarian and anti-war configuration there is. Pallas moves relatively quickly, and she will move into a potentially deadly quindecile with Pluto very soon. At the least, this wondrous but fleeting configuration may buy the Syrian people some time to prepare for the arrival of "Hope and Change".